Nearly everyone knows that not all rifle scopes are created equal. I’ve used some really cheap scopes. I’ve used some really nice ones. One of the more notable scopes I’ve gotten my hands on is the US Optics LR-17 3.2-17x. I currently have it mounted on a .338 Lapua Magnum Weatherby Mark V Threat Response Rifle. I’ll get back to you on the details of the rifle and how it preforms, but I’ll tell you this combination is going be lethal to some hogs and possibly some other four legged creatures. I didn’t have to open the box to have an idea about what this scope is capable of. The specs are right on the end of the box. Included in the list on my box are things like 3.2-17 power magnification, T-Pal Left Side Parallax, 30 millimeter tube, 44 millimeter objective, Mil Scale GAP reticle, Digital Push Button lighted reticle, EREK 1/10 MIL 110 click elevation knob and more. All those details are good to know. When you get a scope from US Optics, there are so many features you can customize. Virtually every aspect has options, from the color of the scope body to what type of reticle, different elevation and windage knobs, even what color – if any – illumination is on the reticle and so much more. One of the first things that got my attention is the wide range of magnification. Hog hunting in Texas can provide an extremely wide variety of opportunities for shots. In the thick East Texas woods, or if you hunt from a blind, you may get a shot at less than 50 yards. Hunting the wide open West Texas prairie you may be taking a 1,000 yard shot. You might find yourself stalking pigs in an area where one minute you are walking through scrub with little visibility and the next the scrub opens up to reveal the edge of a plateau with an almost limitless view. Having magnification variable from 3.2x to 17x seems just about right to me. “A quick search of the internet will turn up plenty of information – and misinformation – about focal planes and reticles. The real question to ask is, Why do I care? Here’s the short answer: First (or front) focal plane reticles appear to zoom in or out as you change magnification. Second (or rear) focal plane reticles stay the same size regardless of the magnification. So when you are using one scope for hunting at unknown distances and you want to be prepared to take a precise shot based on a range estimation regardless of the magnification dialed in at the moment, front or first focal plan scopes are handy and fast. In practical terms, it is fast and easy to use, with plenty of elevation to dial in a single rotation of the knob once you have it set up. 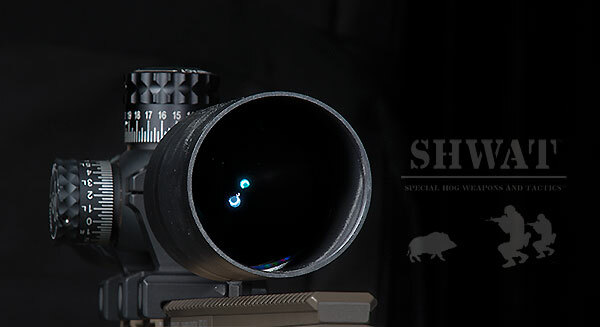 Another great customizable feature of this scope is the illuminated reticle. First the Mil GAP reticle is simple and clutter free. It doesn’t try to do things for me. It gives me the data I need to make accurate shots without any distractions. The illumination can be ordered in blue, red, green, or none at all. My scope has red illumination. It is toggled on and off with an easy push of a button in a turret shaped addition on the right side, forward of the windage adjustment knob. Brightness is controlled via separate up and down buttons in the same location. Once again, simple and fast to use. And that all adds up to better prospects when hunting in dynamic scenarios. As far as I know, that’s every hunt. One of the most basic but important questions you can ask about a scope is: can I see and identify a target, then put a bullet on it, especially if the conditions are less than ideal? With the US Optics LR-17 3.2-17x, the answer without hesitation is absolutely yes! When it comes to brightness, clarity and contrast, it is one of the best I’ve had the opportunity to use. When I zeroed it to the rifle, I was under very dense foliage, with thick cloud cover and the sun was low in the sky by the time I was done. That makes for a low light, low contrast environment. The scope performed quite well in those conditions. To get a whole lot better, you would have to have night vision. US Optics scopes are also quite durable, so if you’re hard on your stuff, if you have a mission that may include some abuse of your rifle scope, or need a scope to go on a magnum rifle, you are covered. With all the customization combined with big, quality glass, and the well thought out functionality, you would be hard pressed to go wrong with this scope. When your vision needs to be lethal, you should consider the US Optics LR-17. Keep an eye on www.SHWAT.com, our Facebook, Twitter and YouTube pages for updates on how this scope performs in the field! And don’t forget to sign up for your SHWAT™ Team membership for awesome discounts and monthly giveaways including a $5,000+ rifle package! This entry was posted in Tactical Hog Blog and tagged Hog Hunting, Hunting, Optics, Scope, swine, Tactical Hog Hunting, US Optics, wild hog hunting, X95 by Stephen Owen. Bookmark the permalink.